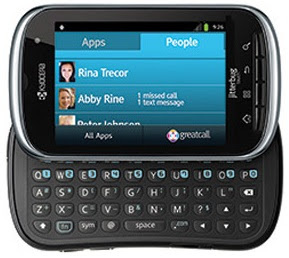 The design of the GreatCall's Jitterbug Touch is identical to that of the Kyocera Milano. It’s round and a little bulky, with the back panel a dull gray soft-touch plastic. The display is a 3-inch, 320-by-240-pixel touch screen which makes it one of the lowest res displays for a Smartphone. The small screen coupled with the poor resolution makes for blurry images. It’s a little better at max brightness. When you slide it open you get a QWERTY keyboard set in 4 rows. The keys are decently sized, elevated and backlit. Typing is easy enough, but given the size of the phone, it’s no typing paradise. There are four physical keys beneath the display; you also have a power button and a headphone jack on the top, volume control and power port to the left, and a camera shutter button on the right side. This is supposedly a 3G Smartphone, but in reality, does not hit the requisite speeds. The plus side is that since GreatCall’s data plans are diminutive, you can be sure you won’t exceed your limit! GreatCall’s Jitterbug Touch Voice quality is nothing to rave about, with scratchy sounds in the earpiece, though not unintelligible. Noise cancellation left a lot to be desired and the caller’s voice went across a little muted. The phone can be used by people wearing hearing aids, and it also has a good speakerphone. Battery life is close to ten hours. The Jitterbug Touch runs on Android 2.3.4 (Gingerbread). That’s a bit of a downer, but it has been tweaked a little, so it’s decent. On switching the phone on, you see 2 tabs on the top of the screen: Apps and People which along with menus are arranged in large font scroll down lists; you can see easily what your phone is capable of. ‘Apps’ has a list of your most used applications like Phone, Messaging, Camera, and Gallery. You can of course, modify the list according to your wish. The People tab is for storing your favorite contacts. You also have touch buttons at the bottom to access All Apps and GreatCall services. GreatCall lets you access features like Featured Apps, Usage, Contact and Help. If you select Contact, you can talk to a customer care representative to help with any issues you have. Pressing Help gives you a descriptive list of instructions on how to utilize your phone, and Featured Apps displays MedCoach Android apps and GreatCall's 5Star, with a few others. The UI has got a few bugs like displaying the wrong name, and the old Android lock screen on boot up. Bluetooth pairing is also a bit difficult. GreatCall’s Jitterbug Touch is powered by an 800MHz Qualcomm chip, and compared to other Android phones, is a little slow, especially navigation and opening apps. Built-in storage is 90 MB along with a 2 GB micro SD card. All music file formats are not supported, though sound quality is pretty decent. There’s a 3.2 MP auto focus camera minus LED flash, and the picture quality is lackluster. While the phone itself is nothing to whoop and holler about, GreatCall’s plans and assistance services make this a great option for seniors and those in poor health and living alone. The Jitterbug Touch costs $169 and is available directly from GreatCall's website.